In their book, Radically Transparent: Monitoring and Managing Reputations Online, authors Andy Beal and Judy Strauss entitle one chapter "You Don't Own Your Company's Reputation." That idea is equally true for schools and districts and should remind twenty-first century school leaders that they "don't own their school or school district's reputation either." It is so easy for administrators to still engage in trying to protect the reputation of their schools, because that is the conventional thinking. But with the advent of social media and self-publishing ability of the web in general, protecting your school or district's reputation becomes an exercise in futility. Instead, 21st century school leaders must shift their thinking from protecting their school or district's reputation to managing that reputation. Trying to control the conversation about your organization is impossible in the digital age. 1. Begin with internal stakeholders. Since you can't really control what people say about you in social media and online anymore, you start your reputation management with those who really know you: your students, teachers, parents, and other employees. Enlist them as advocates. Get them to help you get the word out. They can also alert you to negative talk on social media, so that you can work to get the information out there that tells your side of things. 2. Monitor the web to see what people are saying about your school or district. Set up Google Alerts to catch when someone publishes something about your school. This simple tool will immediately alert you by email when someone posts something about your school on a blog, website or news article. 3. Be transparent: be honest. Managing your online reputation isn't about posting a false information to cover up the negatives about your school or district. It is about making sure what is being said is accurate, and that your side of the story is being told. It is also about proactively listening to what people's beef is about your school, and honestly responding to them. Finally, it's about just being honest and not hiding things. These three starting points are a good place to start for school leaders who want to begin managing their school or district's reputation rather than trying to protect it. As Beal and Strauss indicate regarding companies, 21st century school leaders must realize they no longer own our school's reputation either, and must move their thinking to managing that reputation rather than protecting or controlling it. New North Carolina governor, Pat McCroy, recently made clear his stance and philosophy regarding education. He simply sees little value in a liberal arts education. Economic interests are central to his views on education, at the exclusion of all else. This statement by McCroy betrays his beliefs about the fundamental purposes of education. One can't but help wonder whether he sees education as only a means to economic interest. Of course, there is some merit in the idea of college leading to a higher paying job. After all, who does not want to a good job after spending four years time and hard-won money obtaining a college degree? But, and this is important, let's not dangerously venture too far in that direction either. The true danger in McCroy's views on education is taking a too narrow view of education's purpose, a view that lacks a vision and eye to the future. Education's goals should include economic interests, but it should also include wider interests as well. Things like furthering human potential, bettering oneself, and expanding our horizons should equally be important. Perhaps education's goal should be simply to better ourselves as human beings, and that is not measured solely by our economic contributions. Those are measured by our greater contributions to the world around us. Seeing education as more than a pathway to a job as these goals do, means seeing all of education's potential. Governor McCroy specifically knocks the gender studies progam at UNC in his statement, which he clearly sees as a waste of taxpayer money. But I think his statement and views are quite dangerous. We don't have to agree with all that is taught in universities and colleges, but who is omniscient enough to start making the decisions on what degree programs should be cut and what should be kept? Traveling down that road is quite slippery and could lead us to a university system that is quite capable of feeding the economic interests, but is incapable of producing people who can see beyond their own selfish economic interests. In the end, I can only hope that many, many college graduates let Governor McCroy know that we do not want he suggests, which is to turn our university system into just a servant to economic interests alone. Higher education should not be turned into a factory that churns out workers for business and industry. It should also provide graduates who have a much larger vision for themselves and the world. Notability is an iPad app for taking typewritten and handwritten notes. It has a simple interface, with only the minimal features that support these tasks. Here are some of its most prominent features. Take or write handwritten notes. You can use multiple colors, and even move your handwritten notes about the page. Record and attach audio notes to your documents. Send and store your notes in the cloud. You can send them to applications like Dropbox, Google Drive, or even iTunes. Highlight notes in your document. Create and organize your notes by categorizing them. Overall, Notability is an excellent app for its current price of $1.99. 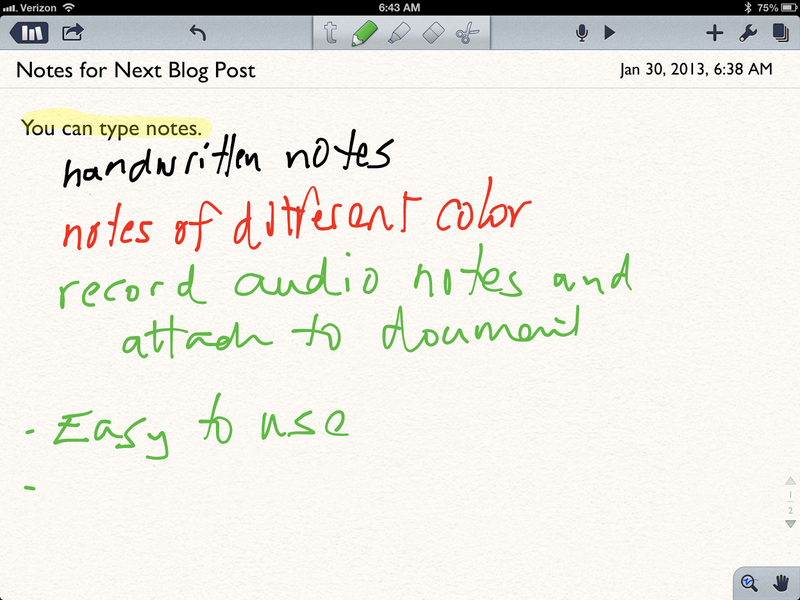 For those who rely on being able to take handwritten notes on their iPad, Notability is a solid, economical choice. The entire concept behind apps like Flipboard appeal to self-centered approach to information that we all seem to have now due to the Internet. We like our news delivered to us, instead of going out to get the news from Web sites. Flipboard allows you to choose the news and news sources you want to read when you want to read them. That is a 21st century expectation. With a recent update, another app also has become one of my favorite news aggregation apps. Like Flipboard, Google Currents, pulls down your news and RSS content into magazine-like interface, and the new Google Currents just got better with this last update. It has a sleeker look, adding content is easier, and accessing that content is more streamlined. While Google Currents gives you access to much the same content as Flipboard, it is an excellent choice for bringing your news to you in a format that is easy to read and share. Check out the iTunes page for more information regarding Google Currents. Both of these apps are excellent choices for bringing news straight to your iPad or Android tablet. My district chose to bring a police presence into each of the elementary school buildings by partnering with the Newton Police Department and by providing office space for police officers in our elementary schools. While no specific officer is assigned to these offices, any police officer may stop at the school at any time and use these offices for completing administrative tasks. Solving the school security issue takes more than just looking for cheap, quick solutions. Those kinds of solutions only bring about even more problems. To address school safety, we need the combination of thinking outside-the-box and partnerships with our community and civic organizations. In his book entitled The Mindful Leader: Awakening Your Natural Management Skills Through Mindfulness Meditation, Michael Carroll writes, "When we lead a career that is sharply focused on being more successful, more admired, or just more comfortable, we can deceive ourselves into neglecting the world around us. We end up managing our lives like projects rather than actually living them." To add to Carroll's points about authenticity, Dennis Sparks writes, "Outside-the-box leaders know that their authenticity is a potent source of influence and that honesty is at the heart of authenticity." How then, does a 21st century leader develop this "authenticity"? How do we as school leaders avoid the pitfall of managing our lives like projects, instead of remaining authentic in the middle of them? The answers to these questions have been at the center of my own explorations in recent months. Those explorations have taken me through the writings of leadership experts like Dennis Sparks, Ken Blanchard, and Paul Houston. This same journey has also taken me through the writings of Buddhist thinkers such as Thich Nhat Hanh, Jack Kornfield, Phillip Moffit, and Michael Carroll. It has even prompted me to attend a Buddhist retreat, which I posted about here. So what have I learned from these masters of leadership and Buddhist thinkers? I have learned at the end of the day, what matters the most to leadership is being authentic. Being present at all times is the way to effectively lead and influence others. Being authentic is more than just being yourself; it also means acting with integrity, pulling off the masks we tend to put on, and courageously facing the truth of every moment of our day. Being present means being in the moment at all times. In practical terms, it means not getting lost in the "what-ifs" or "might-happens." Furthermore, it means being patient, and fully listening to others. In the 21st century, school leaders would do well to foster authenticity and presence each moment of each day. How then, do we do that? Here's my own Four Principles for Fostering Authentic 21st Century Leadership and Presence. These are derived from my readings of the above, and my own mindfulness practice as well as my attendance to a meditation retreat this past summer. 1. Being authentic begins by leading from the inside out not from the top down. Being authentic with those we lead means offering daily, ourselves. There are no masks, and no room for hiding at the top if we want to be authentic leaders, and to truly be present for those around us. Top down leadership separates us from those we lead, and is sometimes useful, but it does not foster authenticity and presence. We must be willing to accept vulnerability as a normal part of our leading. 2. Being authentic means becoming an "open leader." In addition, we become totally present with all that is happening. Through deliberate practice we foster an openness that makes us totally available for what happens each moment of our day. Instead of following our thoughts off into planning, we sit and are present when others come to us with issues or problems. In the midst of crises, instead of being led off by our emotions, we choose to be present, which means we acknowledge our fears and concerns, but we are not led off by them. We remain present, which is the strength of being authentic, even in unfortunate situations. 3. Being authentic means we have a willingness to abandon our own version and vision of reality to engage the present. In practice, this means we aren't blinded by our truth and views. In the interest of being authentic and present, we simply let go of our versions of reality, or at least do not cling to them tenaciously. Being an authentic leader means understanding that we can't be attached to the idea of being right at the expense of everything else. Being an authentic and present leader means there's no room for "It's-my-way-or-the-highway" brand of leadership. Clinging to our own version and vision leads to inauthenticity and non-presence. 4. Being authentic means cultivating "complete generosity" or what Tibetan's call "jinpa." In practical terms, authentic leaders practice this by generously offering themselves to others without making ridiculous demands or placing lids on situations. Instead of trying to lead by always winning over or guarding our own point of view, we let go and lead by total exposure of our generous selves. We gladly take on a willingness to be vulnerable and express our humanity simply and authentically for the sake of generosity. We rid ourselves of the habit of thinking we need to place lids on ourselves and others. We grow and continually grow in generosity. As leaders of 21st century schools and school districts, it is too easy to get lost in our own career advancement, the latest reform measures,being successful, or gaining admiration. These things lead away from authenticity, not toward it. We do sometimes turn our lives into projects instead of just being authentic. Take a moment today, and just be. A 21st century skill that all students need badly is the ability to spot misinformation. As educators, we desperately need to do as Loren Collins states in her book, Bullspotting: Finding Facts in the Age of Misinformation. We need to "arm our students with baloney-detecting tools to prevent false and unsupported beliefs so that such beliefs can be better contained." In other words, 21st century educators need to equip our students with "baloney-detection" skills. What do these baloney-detection skills look like? Here's a starter list based on those described by Collins. 1. Be skeptical when people toss around the phrase "it's just common sense." Many individuals use this phrase as if it were sacred and unquestionable. The truth is, many things once accepted as common sense turned out to be flat wrong. Just ask those who said the world was flat. Using this phrase should never protect information from a skeptical examination. We need to teach students to be skeptical, always, when someone employs this phrase in an argument. 2. Be able to employ the scientific method to test information. In an age of misinformation, our students must have the ability to test hypotheses and conclusions they encounter. They need to be able to pose a question, research that question, construct a hypothesis, test that hypothesis, analyze the results, and finally draw conclusions. Their final conclusions should then always be subject to further validation. All of our students need to be able to employ these steps to test information because of the amount of misinformation posing as science all around them in cyberspace. 3. Be able to identify ideological and agenda-driven websites and information. In the age of misinformation, the ease with which individuals can publish information online has created a whole new world where anyone, no matter what their beef, can publish. It is vital that our students maintain a level of skepticism and explore the ideologies and agendas those publishing web sites might have. All information needs to be examined with a skeptical eye toward what that person's beef might be. 4. Be aware of their own confirmation bias and the role it has in being misinformed. We know if we are heavily biased toward confirming our own beliefs, we hinder the ability to dispel ourselves of beliefs that might be false. We, and our students, need to be aware of our tendencies to seek out information that confirms what we believe rather than looking at all the data. With these principles in mind, our students need to be able to detect their own confirmation biases and those of others as they deal with the information torrent. 5. Be aware of those who use anomalies to make their arguments. Individuals who use this tactic, gather up a collection of anomalies and attempt to use the weight of those to argue against a consensus view. This tactic is being heavily used by those spreading misinformation about climate change, and it was also used by those who argued against the ill-effects of smoking. Our students need to be able to recognize when someone is engaged in anomaly hunting as a misinformation tactic and recognize it as a misinformation tactic. 6. Be ware of the use of the logical fallacy of "proof by verbosity." Just because an argument is lengthy and complex does not necessarily mean it is true. Students need to be able to recognize when someone is engaged in this logical fallacy. 7. Be able to notice when someone engages in denialism. Those who engage in this tactic, just deny or reject a widely accepted truth, and they usually offer no solid alternative instead. Those who engage in denialism aren't really interested in determining the truth; they are simply interested in rejecting one. Our students need to recognize denialism as a tactic that tries to deflect away from what has been accepted by consensus. 8. Notice when someone employs fake experts. This is commonly used on the web. Those arguing against climate change or for intelligent design curriculum heavily use this one. In the climate change debate, often those making the arguments are not even qualified as climate scientists. Likewise, organizations like the Discovery Institute employ non-biologists in their arguments against evolutionary theory. Students need the skill of checking the credentials and credibility of the information sources they encounter. In the 21st century, we as educators have a moral imperative to make sure our students are equipped with proper "baloney-detection tools" so that they can avoid being mislead and misguided in a flood of information. Recently, the Duke Sanford School of Public Policy released an updated study entitled "Racial and Economic Diversity in North Carolina's Schools: An Update." The study by Charles T. Clodfelter, Helen F. Ladd, and Jacob L. Vigdor, had some interesting bulleted points regarding the demographic status of North Carolina Public Schools. Since the early 1990s with the end and weakening of school desegration policies and measures, North Carolina schools became increasingly segregated. In other words, racial isolation has increased. Within school districts in North Carolina, where schools have higher shares of minority students, teachers in those schools have weaker credentials. With growth of enrollment of Hispanic students in North Carolina, school integration is no longer just a black-white issue. Hispanic enrollment has grown from 1.5 percent in 1994-95 to 13.3 percent in 2011-12. Though it appears the racial imbalance has stopped growing, the economic status imbalance has increased and is still increasing. The next logical question is, What does this mean for educational leaders in North Carolina as we move further into the second decade of the 21st century? It means we as 21st century school leaders are going to be leading less diverse educational communities. It means we as 21 century school leaders are going to have to make sure our students gain understandings of diverse cultures because many are attending schools where multicultural experiences are lacking. It means we as 21st century school leaders must recognize the continued need to grow in understanding and knowledge of Hispanic cultures. Finally, it means that we as 21st century school leaders must find ways to mitigate the growing economic imbalance in our student population. 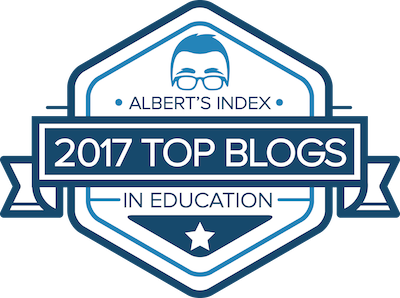 American Education's War on Student Engagement: We're Losing Them! "The longer our students stay in school, the less engaged they become." In a word, we are boring our students into oblivion. This issue is not something a new set of standards will fix, nor will a "new generation of assessments fix." Engagement is a product of what we are asking our students to learn and how we are asking them to learn. Apparently, the more we keep kids in school, the less they see the point. Here's some other interesting points from the survey's report. Perhaps our overzealous focus on standardized testing in this country is one of the culprits killing student engagement. Our school system is not only failing to embrace entrepreneurial talent in our students: we are actually neutralizing that talent. Instead of chasing after test scores and adopting new standards, perhaps it is time to start honestly looking at those things that are causing students to disengage and simply change them. But I realize that is too simple. I suspect the real culprit is this tight-fisted grip Americans have on keeping schools as they are, because, after all, they worked for me, but that is probably a question for another blog post. The truth is though, the kids are no longer buying what we're selling, yet we keep selling. It is time to fundamentally do things differently. As a heavy reader on my iPad, I have been looking for an RSS Feed Reader for my iPad that makes reading my Google Reader feeds easier and a more pleasant experience. I have tried several RSS feed reader apps, and I think I have found one that shows promise and offers an excellent reading experience. That app is Mr. Reader. While Mr. Reader looks in some ways like a normal RSS Reader, it has some features that make it a more interesting and effective. Mr. 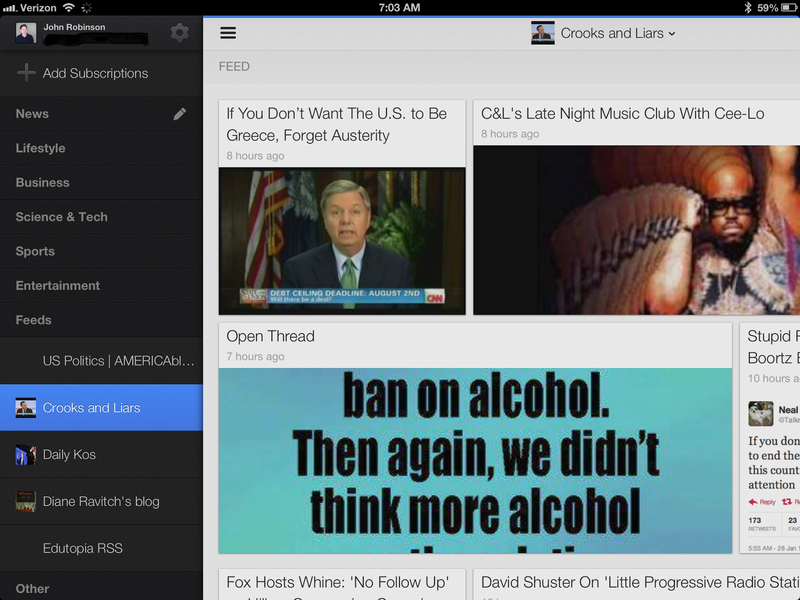 Reader is an excellent RSS Feed Reader app for those who use Google Reader as their RSS aggregator. As an iPad app, it is a little bit more pricey than other apps, but its features make it an excellent app. 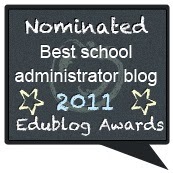 In November 2010, I wrote a blog post entitled “Top iPad Apps for School Administrators.” That post has been one of the most popular on my blog for quite sometime. Now, two years later, I have found myself using many of the same apps, but also some newer ones as well. I thought it time to revise my list of iPad apps now that I have returned to using the iPad. Not all of these apps are free, but I consider the price for these apps to be well-worth the costs. If you are new to the iPad and are looking for apps for your tablet, these are a good start. If you are a power iPad user, hopefully you will find an app or two here to add to your list, or maybe you can suggest some of your own top apps. You will also notice I have included some entertainment apps on my list as well, after all, even principals need to wind down once in a while. Free Books: This is an excellent app for those educators and administrators who love the “classics.” With this app, users get access to over 23,000 classic works. The former English teacher in me loves this one. For more information on the Free Books App for iPad, check out the iTunes Preview of the Free Books App. GoodReader: This is my favorite app for reading major PDF files. GoodReader allows users to annotate and manipulate text in so many ways. You can highlight, underline or draw a box around important passages of text. You can insert your own text on the PDF document. You can also insert “sticky notes” as well. GoodReader is a great way to read PDF files. For more information on the GoodReader App check out the iTunes Preview of GoodReader. iBooks: This excellent ebook app allows users to read books bought from the Apple bookstore, and it also allows users to upload and read PDF documents too. For more information on the iBooks app check out the iBooks iTunes App Preview. Kindle: The Amazon Kindle app is also a must-have e-reader for the iPad as well. Amazon has the most extensive offerings of ebooks available. The Kindle app can also be used to read documents from the web as well as well as other PDF documents. Add the “Send to Kindle” app to your Chrome browser and you can send almost anything to be read in your Kindle app on the iPad. For more information on this app, check out the Kindle app iTunes App Preview. Nook: Those of us who are serious e-book addicts, have purchased ebooks from both Amazon and Barnes and Noble. The Nook app gives you access to those purchases from Barnes and Noble. For more information on this app, check out the Nook App iTunes Preview. (Google) Play Books: Google has ventured into the ebook market as well with their Google Play Books. This app allows you to access those books you get through the Google Play Bookstore. For more information on this app, check out the Google Play Books App iTunes Preview. All of these e-reader apps have access to free book titles too. So, it is well-worth it to install all of these e-reader apps on your iPad. EPIX: For those who are movie addicts and have a cable subscription to the EPIX movie channel, you can now add access to your EPIX movies to your iPad. For more information on this app, check out the EPIX iPad App iTunes Preview. HBO GO: If you have a subscription with your cable provider to HBO, you can bring those movies to your iPad in streaming form with this app. For more information about this app, be sure to check out the HBO GO iPad App iTunes Preview. MAX GO: The Max Go app gives iPad users access to programming from Cinemax. If you have a paid Cinemax subscription with your cable provider, you can access on your iPad a wide variety of Cinemax programming. For more information on the MAX GO App, check out the iTunes MAX GO Preview. Netflix: Netflix offers users a wide variety of movies and TV show episodes for a low monthly subscription price. You can access your Netflix subscription right on your iPad with this app. For more information, check out the Netflix iPad App iTunes Preview. Vevo: Even school administrators like music. With the Vevo app users can listen and watch music videos of their favorite music artists. You can search and play existing music playlists, or create your own. For more information on this app, check out the Vevo iPad App iTunes Preview. Pandora: Pandora is a personalized radio that plays music to your preferences and does so across multiple devices, from your desktop to your phone. You can listen to existing music channels or create your own around a favorite artist. For more information on this streaming music app, check out the Pandora iPad App iTunes Preview. Feedler RSS Reader Pro: Feedler RSS Reader Pro is my personal RSS reader of choice. 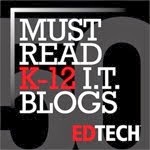 This app connects to your Google Reader account and pulls your chosen RSS feeds down to your iPad, where you can read them, share them on social media, or curate them to your Evernote account. For more information on this app, check out the Feedler RSS Reader Pro iPad App iTunes Preview. Flipboard: Flipboard advertises itself as “your personal news magazine.” It is your personalized news source and then some. Users can easily add favorite sources of news like NBC, ABC and others. 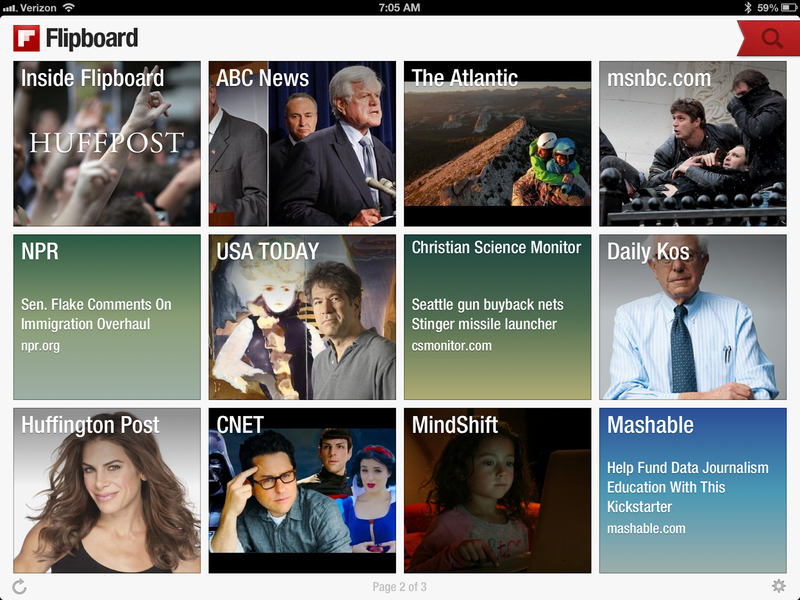 It is a way to get the news delivered to your iPad like you want it. For more information on this app, check out the Flipboad iPad App iTunes Preview. 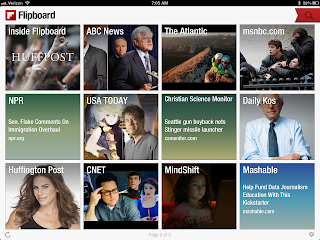 Google Currents: This app functions in very much the same way as Flipboard. It is a way to personalize your news sources and have them delivered to your iPad in magazine-like format. For more information on this app, check out the Google Currents iPad App iTunes Preview. The Weather Channel: This app is self explanatory. Users of this app have access to weather information, both their own and the world’s. Users can also access some of the other programming found on the app’s counterpart cable channel. For more information on this app, check out the Weather Channel iPad App iTunes Preview. Blogsy: With this app, you can create and post to your blog from your iPad. Blogsy has a number of additional features as well such as drag and drop media from applications such as Facebook and Picasa. This app also allows users to work with multiple blog accounts as well. For more information on this app, check out the Blogsy iPad App iTunes Preview. CamScanner: You can turn your iPad into a document scanner with this app. CamScanner is a free app that allows you scan items and then store them as PDF files. For more information on this app, check out the CamScanner iPad App iTunes Preview. Dropbox: This app gives you access to your Dropbox cloud storage account. It is like having your office file cabinet on your iPad. You can also set this account up to automatically receive any photos you take with your iPad. For more information on this app, check out the Dropbox iPad App iTunes Preview. 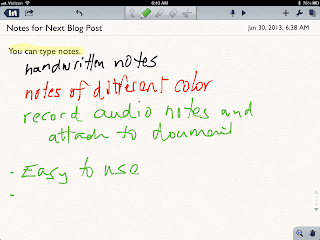 Evernote: This is one of the premier note taking apps and much more. Users can create notebooks and place specific notes in each as well as photos and other files that are uploaded to the account. 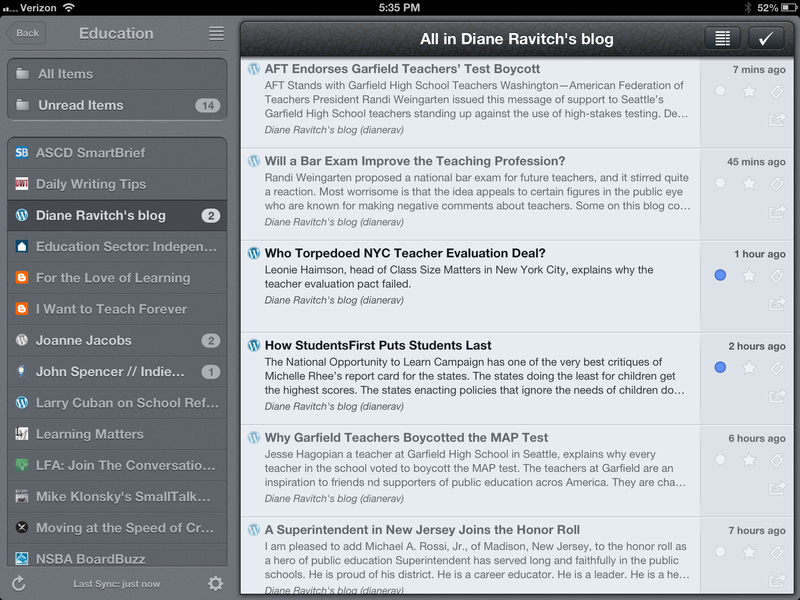 For more information on this app, check out the Evernote iPad App iTunes Preview. Google Drive: If you have a gmail account, you have a Google Drive. With this app you can access both the files you have uploaded to your Google Drive for storage, and you can create Google docs and spreadsheets in this app as well. For more information on this app, check out the Google Drive iPad App iTunes Preview. iKeePass: This app allows users to store and retrieve passwords in a single place. You only need remember one password for all your log-ins with this app. It is also completely compatible with the well-known open source password program called KeePass. For more information about this app, check out the iKeePass iPad App iTunes Preview. Keynote: Keynote is a presentation app created specifically for the iPad. Users can create and show presentations. Keynote also opens PowerPoint files as well. In comparison to other apps, this is a bit more expensive but well worth it. For more information on this app, check out the Keynote iPad App iTunes Preview. Outline: Outline is a Notebook app very similar to Microsoft’s OneNote desktop application. It allows users to create notebooks and then populate those with content. For more information on this app, check out the Outline iPad App iTunes Preview. Pages: Pages is a word processor created for the iPad and mobile devices. Create documents or open Microsoft Word documents. This app's functionality as a word processor makes it also worth the price. For more information about Pages, check out the Pages iTunes Preview. Printer Pro: This app is the only app I have been able to find that allows me to print from my iPad through my wifi. I can print to a printer attached and shared through my desktop computer. For more information about this app, check out the Printer Pro iPad App iTunes Preview. Wunderlist: Wunderlist is an excellent, simple to use To-Do List App. Users can create multiple task lists, and those lists are automatically synced to the web version of the app and back to any desktop versions. For more information about this app, check out the Wunderlist iPad App iTunes Preview. Diigo: This app gives users access to their Diigo accounts. Users can access their bookmarks and notes uploaded to their Diigo accounts. For more information on this app, check out the Diigo iPad App iTunes Preview. Edmodo: Edmodo is the premier social media environment for educators. Users can use the iPad app to access their Edmodo accounts. For more information about this app, check out the Edmodo iPad App iTunes Preview. Facebook: The Facebook app gives iPad users access to their Facebook accounts. It is quite simple and easy to use. For more information on this app, check out the Facebook iPad App iTunes Preview. Google+: For users of Google+, there is also an iPad app as well. With this app users can access content from their Google+ account. For more information about this app, check out the Google+ App Preview in iTunes. LinkedIn: The LinkedIn app gives users access to their LinkedIn account. Check out the LinkedIn app preview in the iTunes Store. Skype: Skype is an app that allows users to video conference and message others. It is an excellent option for out of state interviews for prospective teachers, as well as for bringing experts into the building that would normally be inaccessible. For more information about the Skype iPad App, check out the Skype iPad App Preview in the iTunes Store. Twitter: The Twitter app gives users access to their Twitter accounts. Users can use this app to join in the conversation on Twitter right from their iPad. Its simplicity and ease of use make it great choice for an iPad Twitter account. For more information about this app, check out the Twitter iPad App iTunes Preview. Chrome: The Chrome browser for the iPad gives users the Chrome web browser experience on their tablet. This browser has the same look and feel as its desktop counterpart. By logging in, users can access their Chrome bookmarks as well. For more information about this web browser, check out the Chrome for iPad iTunes Preview. 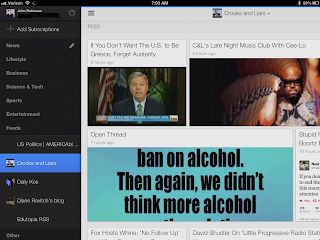 Browsing Pad: This web browser is also a powerful note taking and curating browser as well. It is a browser for the user who needs to take notes while perusing web resources. It also integrates with your Evernote account. For more information, check out the Browsing Pad iPad App iTunes Preview. Google Voice: Google Voice gives iPad users the ability to send and receive text messages through their iPad. All you need do is set up a free Google Voice account and number to use this app. For more information about Google Voice, check out the Google Voice Preview in the iTunes Store. Google Search: This app gives users access to all of their Google apps. In particular, this app works extremely well to access email. I have two Google email accounts, my school account and my personal account set up through this app. It works very well for users who have multiple Google accounts. For more information about the Google Search App for iPad, check out the Preview for this app in the iTunes Store. No doubt many of you also have your favorite iPad apps too. Feel free to those too. In his new book, Building a Culture of Support: Strategies for School Leaders, educator and principal PJ Caposey offers school leaders three things: practical, down-to-earth advice for leading schools; concrete strategies in creating highly supportive school environments; and a compact approach to leadership that brings supporting staff, students, parents, and school community to the forefront. 1. Support the vision, mission and goals. This is done through a process of defining and delineating a school’s current culture, aligning vision, mission, and goals, and monitoring the fidelity of school practices to each. Strategies Caposey offers to do these things include: 1) conducting a self-audit to assess the current school vision, mission, and goals, 2) engaging faculty in creating mission statements, 3) engaging faculty in visioning, 4) developing school improvement plans, 5) principal measures to support the vision, mission, and school improvement goals. Caposey offers school leaders seasoned strategies for engaging in developing and supporting a school’s vision, mission, and goals. 2. Support the professionals. Supporting a school’s professionals, according to Caposey, includes making expectations clear, having tough conversations, leading professional development, sharing leadership, fostering positive relationships, and engaging in fair but effective evaluations. In this book, he gives school principals some highly effective tools to use to support the professionals in a school. Some of these tools include: 1)Best Practices for Difficult Conversations, 2) Delegating Strategies, 3) Building and Maintaining Beneficial Relationships, and 4) Conducting Informal Observations and Effective Evaluations. Caposey offers a toolbox full of ideas to engage in supporting a building’s professionals. 3. Support the students. Support for students in a “highly supportive school culture” begins with the school leader engaging as instructional leader. It also includes transforming instruction, making it more rigorous and making it learner-focused. Caposey provides classroom management ideas and intervention strategies as well. Some of the strategies he suggests includes: 1) Defining the Curriculum, 2) Monitoring the Progress of Rigor Implementation, 3) Making Sure Policy Never Overrides Practice, 4) Student Engagement, and a host of other strategies designed to support students. 4. Support the community. Caposey points out a fourth rule in creating a highly supportive school culture involves doing things like making the school the center of pride in the community and engaging in effective communication with that community.To foster effective communication with the community, school leaders need to do things like establish rules at the beginning, maintain consistency, and engage community support for the school. In each chapter, Caposey walks through each rule, providing careful explanations and concrete strategies to engage in the implementation of each one. For example, Chapter 2 is devoted to rule 1, “Supporting the vision, mission, and goals.” Caposey writes, “By consciously starting with the end in mind, an effective principal can move to the forefront the things that should be truly important to a school and community---enacting the vision and mission of the school or district.” In other words, if you’re going to build a school that has supporting all of its constituents at the center, the vision, mission and goals are the starting point. This chapter provides school leaders with steps to take in support of the vision, mission and goals outlined in school improvement plans. It gives principals tools to conduct fidelity checks to see how the school is doing against its mission, vision and school improvement plans. In each of the subsequent chapters, Caposey tackles the question of how to build this culture of support with all the constituencies of a school. Building a Culture of Support: Strategies for School Leaders is a must-read book for school leaders who are looking for strategies to be supportive in today’s public education environment. For those new school leaders, this book is an opportunity to pick the brain of a seasoned, practicing school principal about transforming a school into a highly supportive one. For the veteran school principal, this book offers a clear opportunity to fine-tune and sharpen their leadership skills that foster highly effective and supportive schools for all. Building a Culture of Support: Strategies for School Leaders is an excellent addition to the 21st century administrator’s library. Can Smith and Wesson Save Our Schools? Or, Will Guns Be Our Undoing? Several weeks after Newtown, the debate about what to do to make our schools more secure continues. The NRA has called for armed guards in every school. Some school districts in Texas and Utah are arming teachers and administrators. One school district in Ohio is arming its custodians. (Montpelier Ohio School Board Votes to Arm Janitors) In typical American fashion, many reactions to the Sandy Hook tragedy have been to grip our guns even tighter and declare certain ideas like assault weapons bans and more extensive background checks as “off-limits.” We simply avoid considering that this insane insistence that “having our guns because the Second Amendment says so” is perhaps part of the problem. The problem with the idea of arming school employees is that it will not work. Just placing a gun in the hands of a school employee with minimal firearms training is ludicrous. At minimum, these individuals need the same kind of crisis training that law enforcement officers get, and I would argue that they need to keep training continuously to ensure that they react in the same manner a police officer would in a shooting situation. If there is anyone carrying a gun in my building, I want them to know more than how to load it and shoot effectively at a target. I want them to be able to react and respond to threats just like a trained police officer would. What happens when you simply place a gun in the hands of an individual after giving them a basic program of firearms training? Check out this ABC 20/20 special video entitled “If I Only Had a Gun.” Clearly from the video, you see why this kind of measure is simply a futile attempt to “Do Something” and avoid asking the serious questions. Each of the individuals in the video who are placed in a shooter situation are ineffective because simply having a gun will not make anyone safer. This is because individuals who lack extensive crisis situation training and experience like that obtained by law enforcement will not react in effective ways to deal with the shooter. If we want to really deal effectively with school shootings and gun violence, we need to look for multiple solutions, not just a simple one which is how I would classify arming educators. The whole idea suggested by NRA Wayne LaPierre that “the only thing that can stop a bad guy with a gun is a good guy with a gun” betrays his and many American’s misplaced idolization of the power that guns really have anyway. It is the typical “Wild West” reaction to the gun problem. "Let’s arm up, and if we have any issues we can shoot our way out of the problems." I would add this question, “ We've been doing things that way for a couple of hundred years, so how is it working out?” That the trail of gun victims continues to grow is the answer. LaPierre and many Americans idolize the whole idea of having a gun, and perhaps that is one of the issues we need to look at as part of our multi-solution approach. We need to reflect a bit and ask ourselves why do so many Americans believe so strongly in salvation wrought by Smith and Wesson in the first place? Are we really that afraid of ourselves and our government? Do we really see the only solution to violence is more violence? Just maybe, at the heart of our American gun problem is both the belief that guns only solve problems and not create them and a stubborn insistence on having guns in the first place because of our Second Amendment rights. I want to be optimistic and say that we will resolve the school shooting and gun violence issue in our country, but I am not sure we are reflecting deeply enough and asking the right questions. The NRA is not going to offer anything but a gun solution because they look out for the interest of gun manufacturers, not the interests of students in our schools. I would not expect any deep reflection from them because of this. But it is inexcusable for educators to react without somehow questioning this deep American fascination with owning guns in the first place. Educators owe it to their kids to not oversimplify and jump at the cheapest “we-gotta-do-something” measure that comes along which is what the whole idea of arming educators looks like. I would also say that we don't need to just react and ban everything with bullets either. Instead, maybe we need to begin questioning the American idolatry of guns and why we fundamentally always believe the best response to violence is more violence.